Vauxhall's electric commercial prototype, the Vivaro e-Concept is set to make its debut tomorrow (Wednesday, September 22) at the IAA Commercial Vehicle Show in Hanover, Germany. 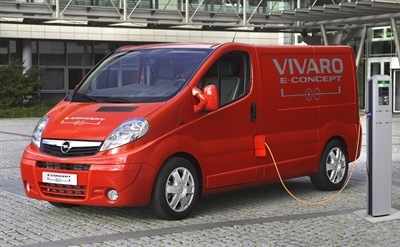 An electric van with an extended range of up to 250 miles, the Vivaro's 111 kWh lithium ion batteries supply 370 Nm of power, enabling over 60 miles pure electric driving range. Using the same range-extending technology as the Ampera, the van is always driven electrically, with a back-up combustion engine able to power the electric motors when the battery reserves are depleted, freeing its drivers from so-called ‘range anxiety’. The lithium ion battery modules, which can be re-charged on a standard household 240V outlet, are mounted under the floor of the vehicle where they are protected from the elements and easily accessible for maintenance whilst still providing 5.0m3 of load capacity and up to 750kg of payload. Chris Lacey, Executive Director, International Operations Opel/Vauxhall Commercial Vehicles, said: "We are convinced that we will get a fantastic reaction from commercial vehicle specialists who use such vehicles on a daily basis. Electric mobility will allow them to travel in city areas which are now off-limits to petrol and diesel-powered vehicles and the range-extender technology makes it possible to use an electric van for normal routine business."